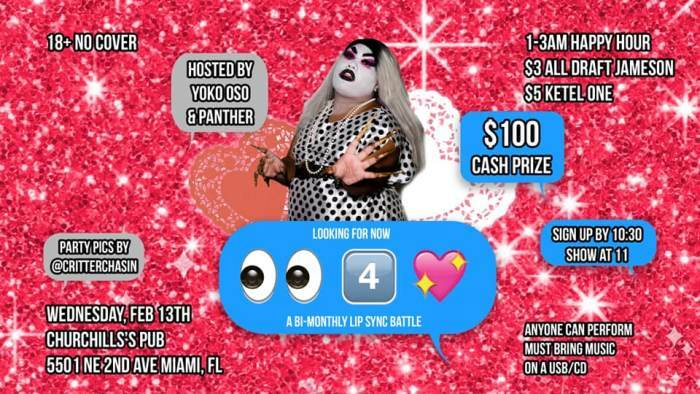 Looking4Love:A V-Day Lip-Sync Battle $100 Cash Prize! Don’t be a drag, just be a queen/king/thing! Come to Churchill’s Pub for 👀4️⃣NOW: A Bi-Monthly Lip Sync Battle where anyone can compete, and anyone can win the $100 CASH prize. Sign up by 10:30, show at 11. DM or Email Yoko to compete! !